The free samples are up! The one-hour free audio samples of the first book in each Sequence of the Liaden Universe® are now up! Dragon Ship is out in hardcover, ebook, and audio book …. This is the kind of day young writers sending out their first story dream of — the day down the road when the world takes notice, when there’s a whole lot going, when in addition to a few awards sprinkled among the time, there are books, books for people to read, books people can suggest to their friends, lots of books. And so I’m pleased and I admit it. As usual there’s a glitch or two — the master link to see our books in one spot as The Liaden Universe at Audible hasn’t been switched on yet — but hey, that’s minor. We’ve been remiss in reporting here the news that both Agent of Change and Fledgling are now available as free downloads from most major sources including Baen Books and Amazon. We’d been thinking about this for some time since so many of our readers and fans have reported that their introduction was a loaned or free copy of a Liaden book. Now you can have copies of these two Liaden Universe® novels for your own ebook or point your ebook-reading friends toward them – for free! 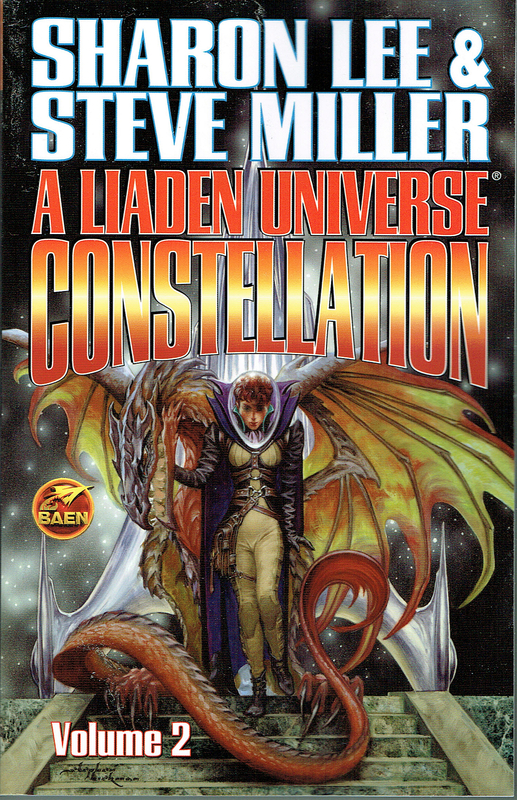 Although the Kindle and other electronic versions were released a little early our Liaden Universe® Constellation, Volume 1 came out from Baen Books in paper July 2, both through online venues and in stores. Early on it briefly hit the Amazon top 10 of SF anthologies and short stories and has been sighted in stores from coast to coast. Here’s your chance to catch up on the stories and adventures you might have missed during the universe’s early years where some of the short stories were first published in hard-to-find genre publications. make sure you have this, and let your friends know about it too! Dragonwriter (collected essays celebrating the life and writing of Anne McCaffrey) due August 6, 2013 from Smart Pop. It’s silly season in the SF/F world; the season when All the Writers remind All the Readers, and especially those who vote on the Hugo Awards, which of their works are eligible for Hugo consideration. If you’re not sure if you’re eligible to nominate and/or vote in the 2014 Hugo Awards, here’s the link to the rules. For January we’ve added a new story to the line-up over at Splinter Universe — you can find it there now. We plan to add a story each month as well as the occasional guest story as well. The new story, “The Rifle’s First Wife” is a novelette of just over 13000 words and will be online for a few months. If you’d like to support these expanded efforts, read the story, and find a donate link at the end. Meanwhile, as things stand now Sharon will not be at Boskone the weekend between Valentine’s Day and President’s Day, but Steve will. Look for a Friends of Liad Breakfast, probably Saturday February 15 in one of the hotel restaurants. Steve had a full slate of program items, a reading, signing and kaffeeklatsch on schedule.